School is in full swing now and what better way to keep the learning going then to do a super fun counting activity! We all know kids like pizza. So why not combined a yummy food kids love to eat and a skill they need to learn. This PIZZA COUNTING ACTIVITY will encourage young learners to practice number recognition and enhance their counting skills. It’s perfect for toddlers, preschool, pre-k, and kindergarten age kids. 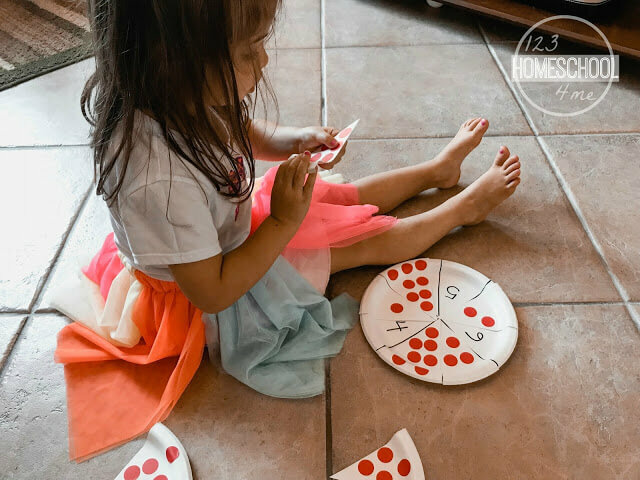 This is such a fun Pizza Counting Activity that will help kids practice counting and number recognition with a fun pizza theme. Gather all the materials you’ll need for this activity. Cut one paper plates into pizza slices. 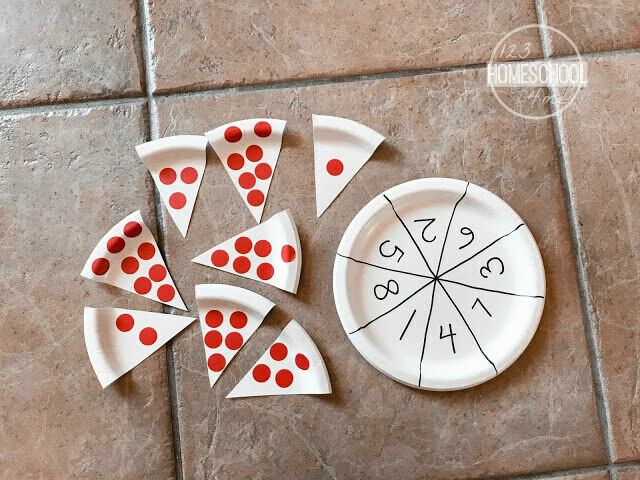 The good thing about this activity is that you can make 8 pizza slices to practice the numbers 1-8 or just 4 pizza slices if you want to start with a small amount of numbers. Then depending on how many pizza slices you cut, make the same amount of pizza slices on the other paper plate using the black marker (this will be the whole pizza). Then write a number on each slice on the paper plate that is not cut. 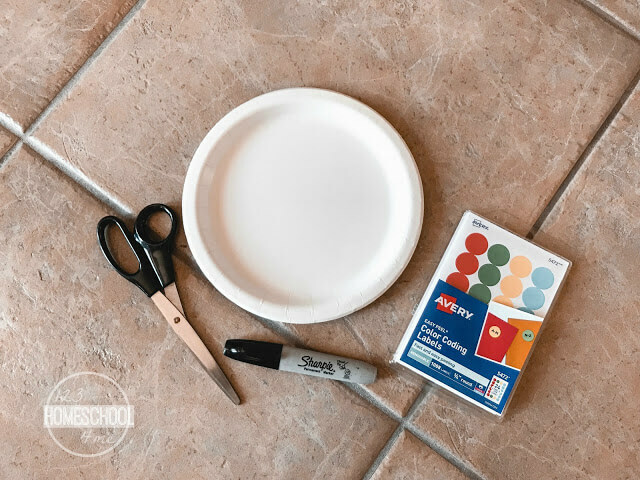 On the paper plate that you cut into pieces, use the red dot stickers and add then to each slice to match one of the numbers on the whole pizza. Once I was done getting this activity ready I gave my daughter the whole pizza first. The one with the numbers on it and we went over each number together. Then I handed her the pizza slices and I had her count the red dot stickers on each pizza slice. 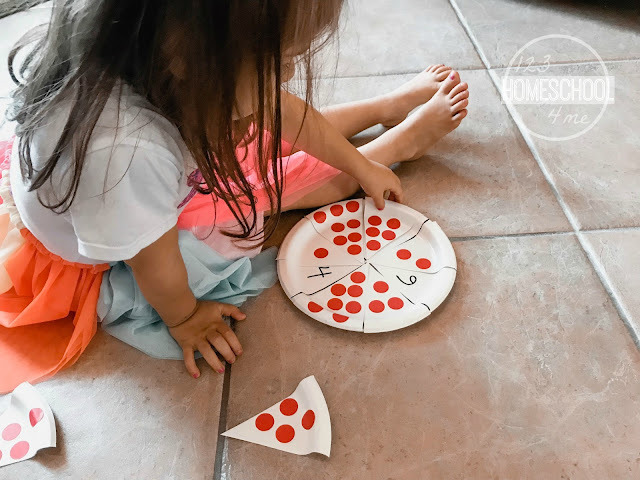 Once she did that she began to match the pizza slices to the whole pizza by recounting the red dot stickers on each pizza slice and then placing that slice on the whole pizza over the correct number. 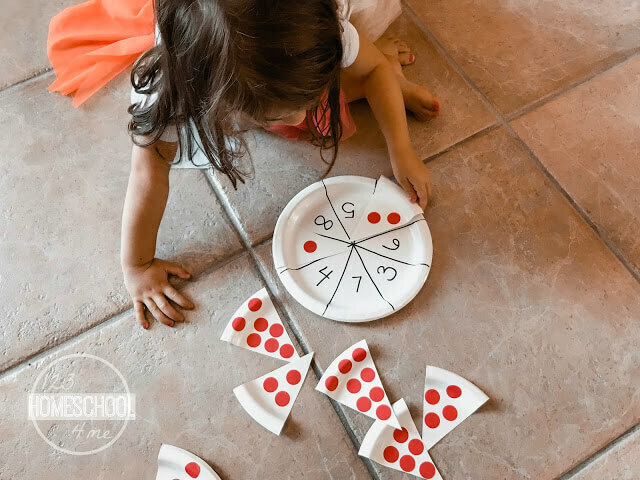 This PIZZA COUNTING ACTIVITY was the best! My daughter loves all things food and cooking so this was a winner for her. She even served me a piece of the pizza when she was done playing but I had to count the red dot stickers (pepperoni…….lol) on it first. Your kid/kids will love practicing number recognition and counting skills with this fun activity at home or in the classroom. Do this activity today and start the learning fun! You may also like our Flower Counting Game that also uses circle stickers. Homemade Taco Pizza – yum!